AquaSymphony ... exceptional spa experience. Grohe put the focus on smart solutions for bathrooms and kitchens at last month’s ISH exhibition in Frankfurt, Germany, with numerous new products showcased in addition to complete bathrooms for stylish living. The global brand exhibited under the theme “Water. Intelligence. Enjoyment” and this approach was also reflected in the layout of its booth, which had oversized projection screens for a multimedia experience and special effects. Several of Grohe items and concepts were exhibited for the first time. The entire exhibit was staged at the large FOR.0 A01 in the Forum building, highlighting the brand’s leading market position and forward-looking ambitions. The bathroom section presented the industry’s largest product portfolio. The focus was, in particular, on the new Essence models with their varied shapes, colours and finishes. The shower department put the focus on smart solutions and new designs. Special highlights included what is arguably the world’s most exclusive bathroom, with the new AquaSymphony luxury shower system promising a truly exceptional spa experience. The new Smartcontrol shower interface elevates the simple shower to a whole new experience, while the innovative Rainshower SmartControl 360 shower system offers direct intuitive spray-pattern selection with a personalised volume setting and memory function. Security is of paramount importance at home, and Grohe’s Sense system monitors humidity, detects water leaks, instantly alerts residents via phone apps and shuts off water automatically. 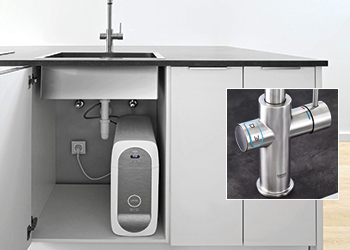 Grohe Blue Home ... designer tap mixer combined with a high-performance filter, cooler and carbonator. “This year’s ISH exhibit clearly positioned Grohe as a provider of complete bathroom solutions,” said a company spokesman. In addition to the Grohe Sensia Arena shower toilet, visitors were also able to view new ceramics collections. Shown together with matching Grohe faucets, they demonstrated the allure of perfectly coordinated bathrooms. The new bathroom ceramics were developed in conjunction with Lixil, Grohe’s Japanese parent company. The centrepiece was a concept bathroom devised by Lixil architect Shigeru Ban. The Lineare range of taps and mixers, whose aesthetic is minimal yet highly inviting, was also on show. In keeping with the concept of minimalism, Lineare uses only the necessary elements to achieve the thinnest possible appearance. In the kitchen showroom space, visitors were able to try out the new foot-controlled kitchen sink taps and other new technologies. Grohe’s team gladly treated guests to delicious beverages prepared using water from the award-winning Grohe Blue and Grohe Red systems. Grohe recently received the ‘Best Of The Best Iconic Award’ for Grohe Blue Home. 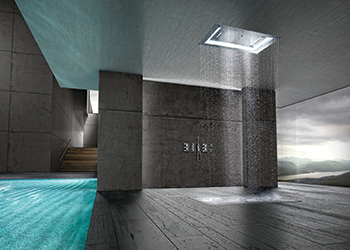 This is one of four Iconic Awards won by the company, the other three including the Sensia Arena shower toilet, AquaSymphony multispray showerhead with light and sound, and SmartControl shower system. Grohe is a world leading provider of sanitary fittings and a global brand, dedicated to providing innovative water products. With its engineering, innovation and design activities firmly anchored in Germany, Grohe products bear the badge of quality ‘Made in Germany’, ultimately strengthening the customers’ confidence in the brand. Over the past 10 years alone, Grohe has won more than 240 design and innovation awards as well as top rankings as one of “Germany’s most sustainable major companies” and the CSR-Award of the German Federal Government 2017. High-profile projects around the globe are fitted with Grohe products, testifying to architects’, designers’ and developers’ preference for the brand. Grohe is part of the Japan’s Lixil Group, a leader in the sanitary ware industry, managing a broad portfolio of well-known household brands such as American Standard, and Inax.